Join game master Bryce Whitaker as he leads co-hosts William T. Thrasher, Brendan Cass, Clint Staples, Amanda Kahl, and Michael O. Varhola through an exciting session of Fearlight Games’ Hood: Swashbuckling Adventures in Sherwood! This title is pay-what-you want and the requested payment is 1 cent. Highlights of the demo game include an explanation of Hood’s innovative “Stunt” mechanic and the maneuvers and actions our players created using it (including the now-classic “Peggin’ a Shorty”); multiple exciting “clashes” of steel”; and a final surprise-filled encounter with the witch herself. You can watch the show right here, but downloads associated with this listing include an MP3 audio version that you can use to listen to it on mobiles devices and a PDF that includes a link to where it appears at d-Infinity Online game magazine, where you are also welcome to take part in the discussion on this episode, and to respond to existing comments or post ones of your own. 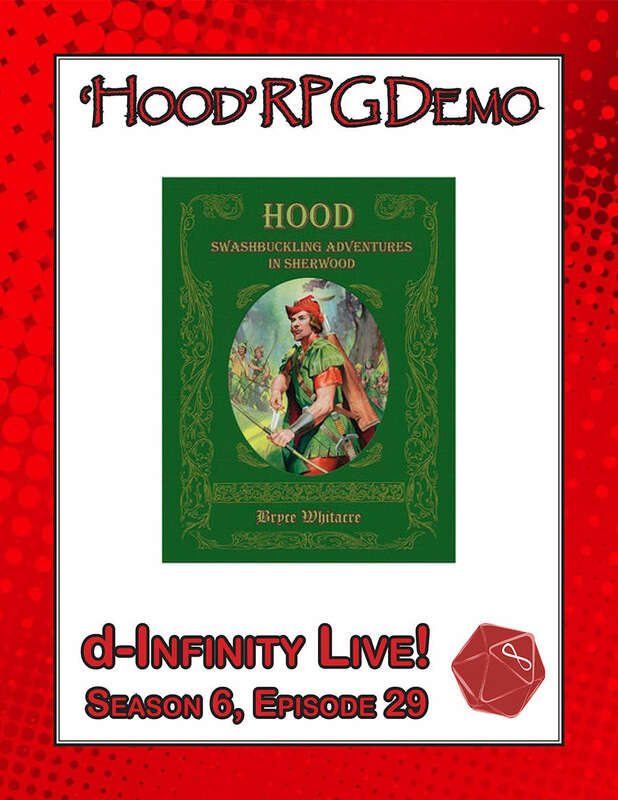 This PDF document also includes a link back to the Kickstarter page for Hood: Swashbuckling Adventures in Sherwood. This title was added to our catalog on September 30, 2017.